Linda Fay Carter Sharp, 70, of Dayton, passed away Thursday, February 7, 2019 in Dayton surrounded by her family. Linda was born May 6, 1948 in Oak Grove, Louisiana to her parents, Shelby Eugene and Ella Ruth Freeman Carter. Service for Mrs. Sharp will be 11:00 a.m., Thursday February 14, 2019 at Pace Stancil Funeral Home in Dayton. Interment will follow at 2:00 p.m. at Houston National Cemetery. Visitation will be Wednesday February 13, 2019 from 5:00 p.m. until 8:00 p.m. at Pace Stancil Funeral Home in Dayton. Linda was a former resident of Spring and had lived in Dayton for the past 25 years. She was a purchasing agent in the construction industry for 25 years. Linda enjoyed travel from road trips to cruises. She liked collecting rocks from the places she visited. Linda loved the time she spent with her family especially the grandchildren and great-grandchildren. Mrs. Sharp is preceded in death by her parents; her husband, David Sharp and her brother, Lamar Carter. 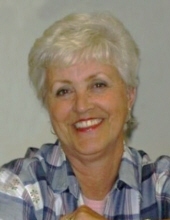 Linda is survived her daughters, Shelly Marrs and husband, James, Renee Turman and husband, Gene; son, Steve Peters and wife, Julia; honorary daughter, Lisa Moore; ten grandchildren; 20 great grandchildren; brother, Larry Carter and wife Judy; sister-in-law, Wanda Carter; aunt, Nell “Bootsie” Aultman and husband, Archie; numerous other relatives and many friends. To send flowers or a remembrance gift to the family of Linda Fay Sharp, please visit our Tribute Store. "Email Address" would like to share the life celebration of Linda Fay Sharp. Click on the "link" to go to share a favorite memory or leave a condolence message for the family.